For 60 years, Dove has been celebrating real women through the campaign for “Real Beauty”. This year, the company extended their efforts into the most wonderful, yet anxious time in a woman’s life: motherhood. Dove has dabbled in the baby category in Canada for the past 10 years with little growth. With the current Baby Care market worth $55 million and projected to grow by +2%, Dove saw this as an opportunity to launch a new line of Premium Baby Care Products: Baby Dove. Entering the market wouldn’t be easy. They had to compete against juggernaut Johnson & Johnson, who already owned 63.7% of the market with their J&J Baby and Aveeno Baby brands. While motherhood should be a joyful time, all too often it is filled with insecurity and an unhealthy obsession with portraying an image of the perfect Mom. Maddeningly unattainable photos of picture-perfect Moms and their picture-perfect babies are no longer reserved for Hollywood celebrities. They are everywhere: in ads, on TV, on Facebook and Instagram. These images are making new Moms feel overwhelmed, insecure, and even incompetent. In some cases, they are even contributing to a rise in post-partum depression. To confirm whether there was any merit in these observations, a study was commissioned to better understand Millennial Moms and the pressures of motherhood. It determined that these pressures are very real and very alarming: 99% of Moms feel pressure to be perfect, 81% question if what they’re doing is good enough, and 75% feel unable to cope at times. 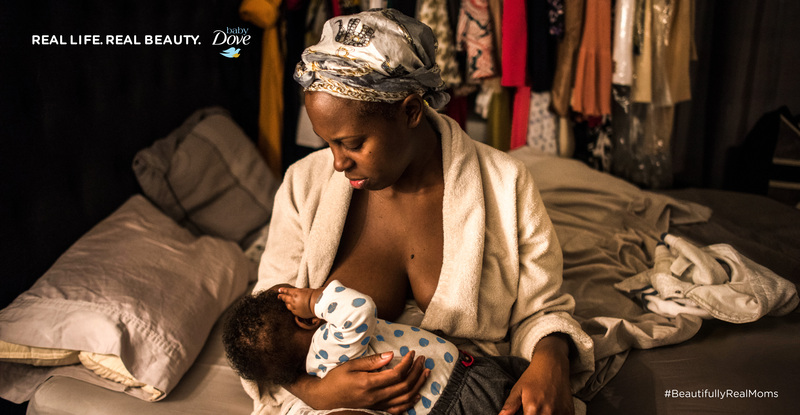 Given Dove’s heritage in Real Beauty, it only made sense to put a real lens on motherhood amongst the increasingly insecure target, Millennial Moms. If it was possible to give her confidence in her role as mother, Dove could start to wrestle away some of the authority and trust that J&J Baby had, which would ultimately cause her to choose Dove’s brand over the market leader. Beautifully Real Moms emphasized that Dove believes there is no right or wrong way to be a parent. There are no perfect moms, only real ones. By celebrating the diversity of Moms and the different ways Moms parent, the campaign would alleviate her pressure to be perfect. Moms, and by posting their own #BeautifullyRealMoms photo in support of real Moms everywhere. BabyCenter.ca is the number one site for expectant and new Moms but it is also a J&J owned property. Since Dove was locked out of Canada’s largest baby site, the team had to find another way to reach their target. So campaign activity was focused on the very places where her insecurity and pressure to be perfect originates: social media. In the first year on the market, Dove captured 9% share, while J&J Baby lost 3%. An ROI of 4:1 was achieved and added over $5M worth of sales to the base business. Dove’s brand equity was also increased against the following statements: “Makes you feel reassured as a mother” (increased +4, while J&J Baby decreased on this statement by -7), and “A brand you trust more than other brands” (increased +10). This was a statement that J&J had historically owned and enabled Dove to hit right at the heart of J&J Baby’s equity. Purchase consideration (in terms of top 2 box scoring) increased by +6, while J&J Baby’s purchase consideration decreased by -4. The Gallery of Real Moms received over 140,000 visits, more than double the goal, and outperforming the average time on a webpage by 76%. Social posts had an average engagement rate of 7%, exceeding the category average by 5%. Campaign PR reached outlets such as Huffington Post, National Post, Toronto Sun, Today’s Parent and Cityline.